“My parents did not raise me to be speaker of the House. They raised me to be holy. They raised me to do the right thing,” claimed Nancy Pelosi (D-Calif.) as a Baltimore street was named after her. But there is more to the story because she’s just the latest and maybe the most dangerous leader in the long campaign by anti-Catholics within the Church who mislead Americans, get elected and advance the culture of death. For years I have supported American Life League’s crusade to end the sacrilege of pro-abortion “Catholic” politicians receiving Holy Communion and apparently the plea was heard in Rome. Even so, Pelosi’s propaganda included a Mass “in recognition of House Speaker-Elect Nancy D’Alesandro Pelosi,” at her alma mater Trinity University in Washington, D.C. on Jan. 3. I wasn’t invited, but I went. House Sergeant at Arms Bill Livingood and his men welcomed me. 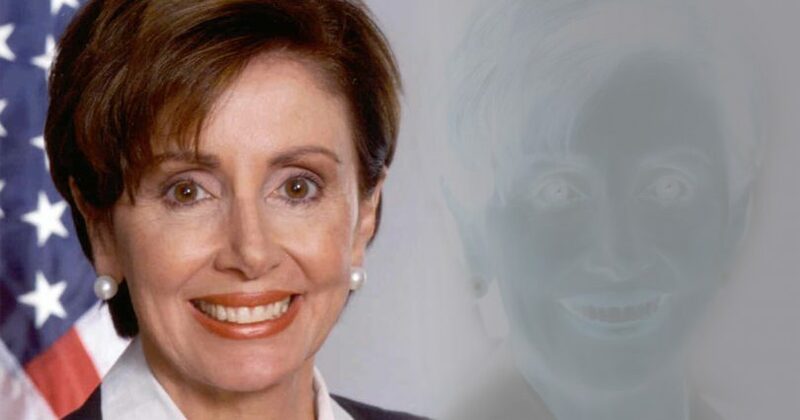 Then I was invited to sit among dissident politicians, but I sat farther back to worship Christ, pray for Nancy’s change of heart and avoid the appearance of approving the spectacle. To my horror, the “presider” of Pelosi’s Mass was 86-year-old Father Robert Drinan, S.J., whom I had known for 34 years. That summer, Fr. Drinan campaigned against the Vietnam War at my parish Saint Paul the Apostle in Westwood, California. When I asked Fr. Drinan about his defense of Roe, he swiftly, violently and inexplicably karate chopped my neck with his right hand. My wife Sallie broke down in tears. “You didn’t expect that, huh?” he snarled at me. “I’ve been warned about you right-wingers.” I restrained myself, but direct combat with Drinan resumed when I was elected to Congress as a Republican. In 1977, my first year in the House and Drinan’s seventh, the first attack of the 95th Congress was made against the year-old Hyde Amendment, now a U.S. law preventing taxpayer funding to kill babies in the womb. Drinan was waging war on preborn innocents and he had the propaganda game down. He always wore his Roman collar and he misappropriated Catholic teaching. The scandal of bad example unfolded quickly as 21 “Catholic” congressmen began their pattern of voting to support abortion, using “Fr. Bob’s” blessing as an excuse. Not one of those 21 has come home to truth and respect for life right up to this year of 2007. During the vote, I moved to Drinan’s side as he went to put his voting card into one of the chamber boxes. I implored him not to “betray all my and your years of Jesuit tradition.” I put my hand over the voting slot. He gave me a sneering laugh, moved to another box and quickly voted against my amendment. “God forgive you, Father Death,” I whispered at him. For two and a half more years, I said that prayer many times. But these encounters were not the half of it. In October 1979, Washington D.C. was electrified by the first visit from Pope John Paul II, who had been the Vicar of Christ for just one year. The people’s pope held a huge Mass which Sallie and I attended on the National Mall. President Carter met with him at the White House and invited the members of Congress to meet him on the front lawn. Sallie stood to my right in a line of dignitaries and the ruggedly handsome Vicar of Christ approached us. My heart was pounding. The pontiff took my wife’s hands in his. My beautiful Sallie Dornan beamed with joy. She tried to turn the pope from herself to me saying, “Your Holiness, this is my husband, Congressman Bob Dornan, who tries to defend life,” but she couldn’t finish because the tears began flowing. Fr. Drinan left Congress and taught law at Georgetown University, but didn’t cease his abortion campaign. In 1996, he wrote New York Times and National Catholic Reporter op-eds approving President Bill Clinton’s veto of the Partial-Birth Abortion Ban. Bear in mind what partial-birth abortion is: An abortionist reaches into the mother’s womb, grabs the baby’s feet with forceps and pulls him out, except for part of his head. He rolls the baby over so he doesn’t have to look at the innocent child’s face. He jams a pair of scissors into the back of the baby’s skull and spreads the scissors apart, making a hole. The abortionist removes the scissors, sticks a suction tube into the skull and vacuums out the little baby’s brain. In 1998, Drinan caused further scandal as a character witness at the impeachment hearings of President Clinton (D). In 2004, he advised pro-abortion “Catholic” presidential candidate Sen. John Kerry (D-Mass.). In 2007, Fr. Drinan turned the Pelosi Mass into anti-American politics, all under the guise that he and Nancy cared about the children of Darfur and New Orleans. After he died on Jan. 28, Speaker Pelosi said, “Father Drinan was an inspiration to so many in Congress, not just those who served with him but those of us who came after.” And I fear for his immortal soul. I also fear for the first woman to be “two heartbeats away from the presidency.” Evidently, Nancy Pelosi is Drinan’s star disciple. This propaganda maven, who branded herself as a devout Catholic grandmother, also favors diabolical partial-birth abortion. In Congress, I urged her and all dissident Catholics to vote pro-life. On one occasion, both Nancy and I were “working a door,” which means standing at one of five entrances to the House chamber and confronting members to vote one way or another on a bill up for vote. An abortion measure was up for the vote and Pelosi was in my face at the west door through which most of the senior members entered off the elevators. Her racist excuse was appalling, but she wouldn’t retract it. This is Nancy Pelosi’s work “for the children” and now she’s the most powerful woman in America. On Jan. 14, Father John Malloy, S.D.B., pastor of Saints Peter and Paul Church in her San Francisco home diocese, released an open letter telling Pelosi to stop calling herself Catholic and receiving the Eucharist because “you are fooling yourself and many good Catholics.”1 But her archbishop, George Niederauer, remains silent. And Archbishop Donald Wuerl of Washington, D.C. refused to deny Pelosi and other dissident politicians Holy Communion. He placed the burden on faithful laypersons with his retort, “What are YOU going to do about it?” (Pittsburgh Post-Gazette, Jan. 22). Well, I call Americans to a national prayer and education campaign, including distribution of this article. Several U.S. bishops enforce Canon Law 915, but many do not. Sign the petition to the U.S. Conference of Catholic Bishops at www.CatholicCrusade.com. This isn’t just about Nancy Pelosi. It’s about our beloved Church and country’s future—it’s about saving millions of American children. 1 “A priest writes to Nancy Pelosi,” Feb. 1, 2007, California Catholic Daily.